Eliminate moisture damage in small enclosed spaces with these handy 1 gram silica gel packets. The easy-to-use packs prevent corrosion, mildew, mold, rust and spoilage. The see-through silica gel packets have indicating gel that turns from orange to dark green when fully absorbed to let you know they're full of moisture. 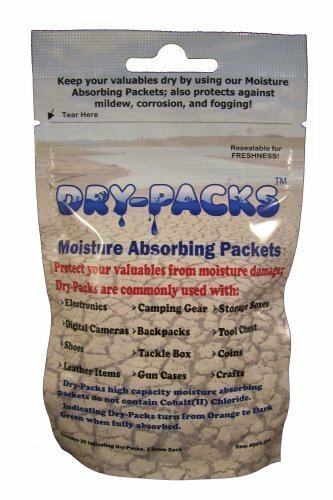 You will receive twenty 1-gram packs in an air-tight aluminum moisture barrier bag that can be zip-locked to keep the unused packets dry and ready to use. You will receive twenty 1-gram packets. 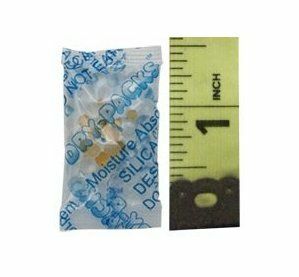 Each packet measures approximately .75" x 1.5" and will cover an area of approximately 130 cubic inches (length x width x height) of enclosed space. 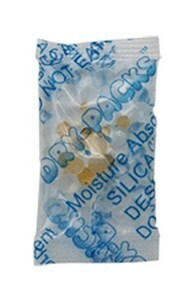 For larger volumes, you can add more packets or purchase a larger unit of silica gel.